Share this product and receive a $0.48 sharing discount. In Total Truth, Nancy Pearcey offers a razor-sharp analysis of the public/private split, explaining how it hamstrings our efforts at both personal and cultural renewal. Ultimately it reflects a division in the concept of truth itself, which functions as a gatekeeper, ruling Christian principles out of bounds in the public arena. How can we unify our fragmented lives and recover spiritual power? 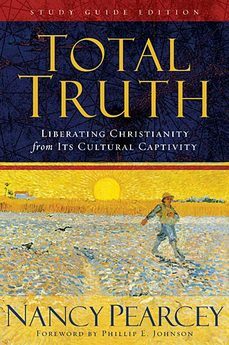 With examples from the lives of real people, past and present, Pearcey teaches readers how to liberate Christianity from its cultural captivity. Total Truth walks readers through practical, hands-on steps for crafting a full-orbed Christian worldview. Finally, she makes a passionate case that Christianity is not just religious truth but truth about total reality. It is total truth.